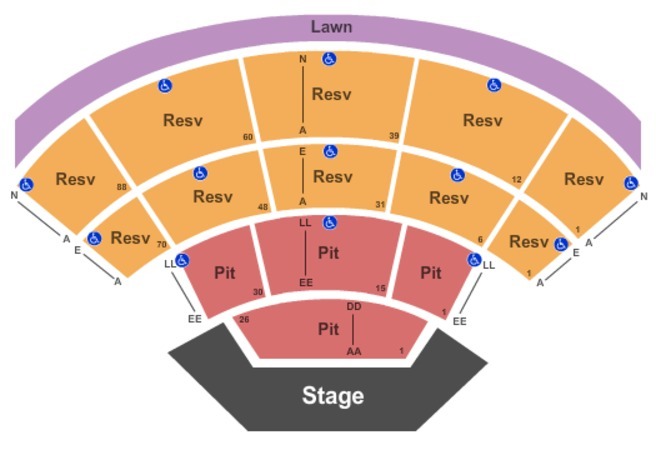 The seating configuration at First Security Amphitheater is divided into 3 sections. Please note all seats are open air and events happen rain or shine! The Pit area is an area for standing guests that is the closest you can possibly get to the stage. There is no designated seats here. The Pit area is general admission. Reserved seating is the second section of open air seats. Purchasing a ticket for reserved seating allows you to pick and reserve your desired seat. The seat you book is final, you are not allowed to change your seat during the performance. These are the only seats available at the venue. Lawn seating is general admission. Simply purchase a lawn ticket and you are free to choose yoru desired location on the lawn allowing you to easily unite with your friends and family and enjoy the show together. There are accessible seats for wheelchair users available in nearly every section. First Security Amphitheater is extremely accommodating to wheelchair users and offers a huge variety of options not offered by other venues. Please contact the venue directly to organize booking accessible seating.